Harvard biologist E.O. Wilson popularized the concept of biophilia, which he described as "the innately emotional affiliation of human beings to other living organisms." To what extent can cities be biophilic and provide basic conditions for urban citizens to live a life in close contact with nature? 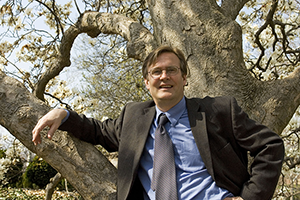 University of Virginia Professor Timothy Beatley addresses this question, exploring some of the ways that cities are integrating nature into their planning and fostering connections to the natural world. Beatley will discuss the Biophilic Cities Project at the University of Virginia and the global Biophilic Cities Network, which aims to extend and expand the important role that nature can play in the growth and development of cities around the world. Offered in conjunction with the Earth Optimism Summit programming at the National Museum of Natural History.